Create a new Gift promotions rule. In the Main rule tab, you will find a new option, IF you first configure other options to specific values. Select 'specific coupon' under Coupon. you will see additional options appear. One of these is the 'Use Auto Generation' checkbox. 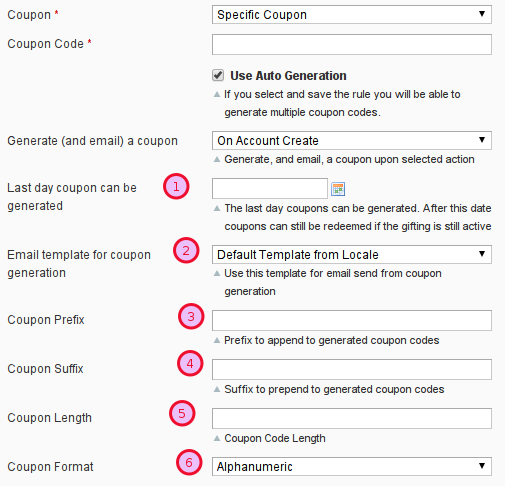 Again, you will see a new option "Generate (and email) a coupon" appear when checked. After one of the above options are selected, you will find additional set of options appear. These are to configure your coupon options. Last day a coupon can be generated: When this date is set, it will not allow coupons to be generated past the set date. Here you must select the email template to be used. Proxiblue has produced three basic example emails, which you can load into magento transactional email section. Simply add in a new transactional email, select the wanted example (starts with 'Giftpromo ') adn load the template. You can then set the subject, and tweak teh email to your store/design needs. Coupon Format: Simply teh type of coupon code to generate. Once you have completed the rest of the Gift Promotion setup, and perform the selected customer action, a coupon will be generated, and emailed to he customer. You can view generated/used coupons in the Manage Coupon Codes tab of the Gift Promotion.